Breakthrough Photography has announced its X-Series line of 3.2mm ultra-slim neutral density and ultraviolet filters featuring a "traction" frame design, glass from Germany and Japan, advanced coatings and weather-sealed construction. And the filters come with a 25-year guarantee. X3 Traction Filter features ta 3.2mm Traction frame CNC machined from brass, Schott B270 glass from Germany, MRC16 and dual nano coating layers. Available in 3-stop, 6-stop Neutral Density and UV. X2 Traction Filter features a 3.5mm Traction frame CNC machined from aluminum, AGC glass from Japan, MRC8 and dual nano coating layers. Available in 3-stop, 6-stop Neutral Density and UV. X1 Flat Black Filter features an ultra-slim 3.5mm standard flat black frame with and MRC4. Available in UV. The X2 and X3 filters feature a new filter design which incorporates texture in the metal achieved by CNC machining brass and environmentally friendly aluminum, the company said. "During our extensive field tests we found 4mm filters on 16mm lenses produced on average +1 stop of light falloff," said founder and photographer Graham Clark. "At 3.7mm the vignetting was entirely eliminated on our full-frame setups. Our standard flat black X1 and X2 traction filters have 3.5mm, whereas our X3 traction filters are machined down to 3.2mm." The X-Series filters are for pre-order on Kickstarter. Breakthrough Photography will also be offering a one-time launch price of 50 percent off. The X-Series filter lineup will be sold through B&H, Adorama and Amazon.com in December. SAN FRANCISCO -- Breakthrough Photography has announced a new line of 3.2mm ultra-slim "Traction" filters featuring glass from Germany and Japan, advanced coatings and weather-sealed construction. Aimed at professional as well as amateur photographers, the new X-Series filter lineup features a new "Traction" frame design with state-of-the-art optics and coatings. The X-Series filters are immediately available for pre-order on Kickstarter with a December delivery schedule. Pre-ordering and product information can be found by visiting the companies Web site at http://www.breakthrough.photography. X3 Traction Filter features the company's signature 3.2mm "Traction" frame CNC machined from brass, SCHOTT B270 glass from Germany, MRC16 and dual nano coating layers. Available in 3-stop, 6-stop Neutral Density and UV. X2 Traction Filter features a 3.5mm "Traction" frame CNC machined from aluminum, AGC glass from Japan, MRC8 and dual nano coating layers. Available in 3-stop, 6-stop Neutral Density and UV. All X-Series filters are double-threaded, weather-sealed and backed by a 25 Year Ironclad Guarantee. "We really tried to take the legacy standard flat black filter design back to the drawing board to really understand what it was that photographers needed in order for a filter to be most effective. Of all the various prototypes and frame materials, the ones with texture in the metal were the clear winners among photographers," said founder and photographer Graham Clark. The X2 and X3 filters feature a new filter design which incorporates texture in the metal achieved by CNC machining brass and environmentally friendly aluminum. "When I first felt these traction filters I thought, 'Why don't all filters have this?' It makes getting filters on and off a whole lot easier," said acclaimed outdoor and nature photographer Art Wolfe. "During our extensive field tests we found 4mm filters on 16mm lenses produced on average +1 stop of light falloff. At 3.7mm the vignetting was entirely eliminated on our full-frame setups. Our standard flat black X1 and X2 traction filters have 3.5mm, whereas our X3 traction filters are machined down to 3.2mm," said Clark. The X-Series filters are available for pre-order on Kickstarter. Breakthrough Photography will be offering a one-time launch price of 50 percent off MSRP. The X-Series filter lineup will be sold through B&H, Adorama and Amazon.com in December. 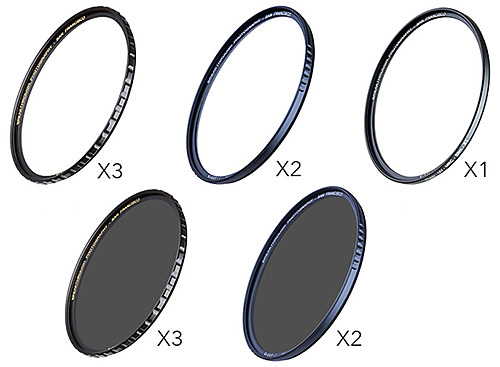 To learn more information about the X-Series filters, visit http://breakthrough.photography.